Drones have many applications, are considered by many fields and disciplines to be incredibly useful tools. My concern lies with our governments use and potential misuse of drones in the targeted killing of military targets. Many innocent people have been killed, women and children, alongside the intended target. As a result, drones have suffered serious damage to their reputation before any non-lethal, non-military drones implemented for any number of benign tasks for which they are imminently capable and perhaps better suited than a human-occupied aircraft. In my first post, I provided an overview of many issues associated with drones. In closing my first post I hinted I would author future posts, offering some current or potential uses. Some of the applications I identify are currently uses, with potential for growth; other applications are more future-looking, not in place today, but perhaps in the not-so-distant future. In my second post, I discussed another field where drone use is opening doors to new exploration techniques. Archaeology is finding many uses for remotely-piloted aircraft, or unmanned aerial systems (UAS). Kites are being equipped with digital cameras. Balloon kits allow researches to hoist digital cameras aloft. More detailed archaeological surveys mandate stability unattainable from kites and balloons. The survey of archaeological sites must be systematic. Flight lines need to be planned in advance of a survey to ensure capture of the area of interest (AOI). Scale of acquired imagery needs to be established. Scale and resolution of acquired imagery must be considered before flying a drone. When the details of the mission have been thoroughly accounted, then imagery is acquired. With regards to UAS, several missions might be flown. The first mission might result in imagery, visually inspected, to help plan the geographic scope of future flights. Sometimes, interesting landforms which imply a cultural imprint can only be seen from above, impacting the scale and scope of later drone missions. In Europe, especially in the U.K., France, and Eastern Europe, drone use has improved the knowledge of culture imprints on the landscape, aided in the inventory of archaeological sites, aided in the detection, analysis, and interpretation of archaeological sites. The third installment on civilian drone use introduces some concepts related to the electromagnetic spectrum. We have to remember our eyes are sensitive to only a small part of the total electromagnetic (EM) spectrum. We must also bear in mind the objects around us reflect EM energy in a variety of ways. Some objects emit EM energy in different wavelengths. My third installment introduces some elementary notions to help further the discussion and direct us to drone uses in agriculture. In my fourth article on drone use I diverge from civilian uses, introducing public use drones. I also am aggregating many different fields into Disaster and Emergency Management / Services (DEM/DES). The scope of DES involves many different actors, NOAA, FEMA, state-level DES offices, and local search-and-rescue teams. From helping with local tragedies to providing services for large-scale, region-wide disasters drones have a myriad of potential uses. Drones can come in a variety of sizes. Some drone prototypes are as small as hummingbirds. Many drones which I have in mind for crossover civilian/private and public use are typically less then 25lbs (12kg) and can easily fit inside a hardsided suitcase. Still other drones are larger, requiring some form of take-off and landing “strip” such as a sidewalk, street or roadway, or small airfield like those located outside most small towns. Many drones require zero landing strips. With 4 to as many as 8 electric or gas-powered engines, these drones are vertical take-off and landing (VTOL) capable. Most drones available to the general public today cannot stay airborne for longer than perhaps 20 minutes. Powered by nickle-metal hydride (NiMH), Lithium ion (Li-Ion), or nickle-cadmium (NiCd) batteries flights will last the length of a single charge. Depending on the size of the vehicle, number and type of batteries, and payload drone flight time is usually less than 15 minutes. 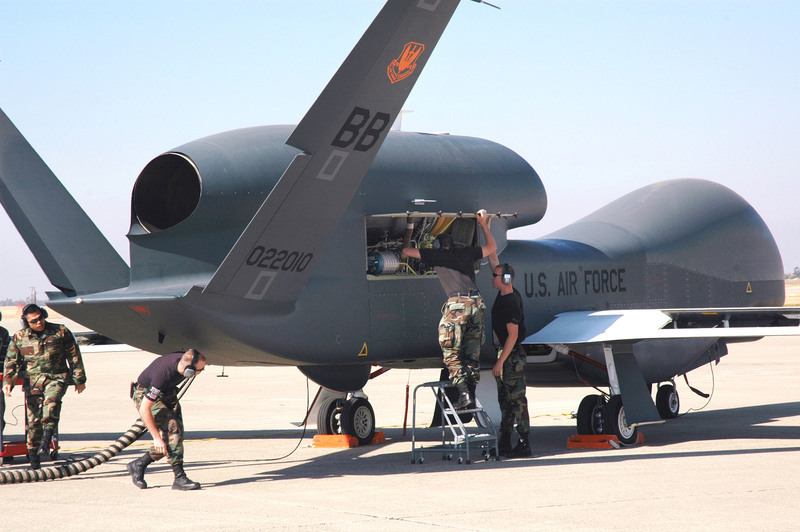 However, we know from press releases and news articles, some drones are huge and have flight times measured in days, not minutes, like the Northrop Grumman RQ-4A Global Hawk. Of course, these are not commercial drones; these are military grade drones. The miniaturization prevalent throughout the cellular telecommunications industry paralleled by same or similar technology in tablets and e-readers is also becoming part of the drone industry. Computer and IC chips, GPS circuits, camera and video optics, WIFI and Bluetooth, open source operating systems, gyroscopes, barometers, audio chips, and USB connectivity are integrated into current drone systems. The era in which we live is experiencing an unprecedented volume of mingling technologies. Miniaturization coupled with mass-production parallel with new light-weight materials and ubiquitous access to technology and few barriers to entry for hobbyists or entrepreneurs has presented an environment rich with potential. Within our lifetimes, we may not even drive in the traditional sense. Our very own cars will become drones, piloted using a symphony of technologies, open source programming, GPS, radar, and Bluetooth. We will see this first with very new, very expensive cars. The new 2014 Mercedes-Benz E-class will come equipped with a complex array of sensors, optics, and sophisticated image processing software. The sensor array and on-board computers will process input data and provide real-time feedback to the driver regarding lane traffic and obstacles ahead. The computers will apply brakes should the driver not react fast enough. Eventually, all cars will be equipped as a standard package such sensor arrays. Additionally, cars will “talk” with each other via a Bluetooth-like local network. Vehicles will transmit data among themselves, direction of travel, velocity, mass, number of passengers, etc., in order to maintain constant and even traffic flow. Your vehicle will emit energy of some form to measure distances to nearby objects, to judge distance, speed, momentum, time to stop, and so forth. We already see this technology being introduced in small increments, like the backup sensors available in the Buick Enclave. After-market backup sensors and cameras are available for retrofitting older cars and trucks. What does any of this have to do with drones? I wanted to discuss size and flight times to introduce the notion of the variety of platforms available to the general public and, potentially, public agencies. I also wanted to mention new technologies we are familiar with, technologies we find in our Kindle Fire, Samsung Galaxy iPhones, or Android tablets. These two technologies are merging. Arduino software is open-source software, based on Java, and controls the input/output boards on many drones. Other boards have the capability of being controlled with flavors of Linux or Android. These boards interface with a multitude of other technologies, like Bluetooth, WIFI, cameras and optics, audio and microphones, plus provide navigation via GPS technology. Moderately priced drones will transmit live HD video back to the remote pilot and capture JPEG images. Some of these drones can be piloted with a Kindle Fire or iPad simply by changing the orientation of the tablet. The wide array of current off-the-shelf technology, low-cost, and few barriers to entry presents a fantastic opportunity for the development of drones designed to serve and protect the general public. Drones equipped with thermal sensors have a number of important and life-saving uses. Imagine a person or people become lost in the wilderness, say Canyonlands National Park. Launching a “flock” of suitably-equipped drones might find lost hikers far sooner than sending out people on foot or 4WD vehicles, and reduces the risk of putting human pilots in the air. Furthermore, due to miniaturization associated with telecommunications, drones could also be equipped with WIFI or even cellular technologies which could ping a person’s cell phone, thereby giving away their location. As the drone would also be equipped with GPS, rescuers would know precisely the location of the lost hiker. Wildfires are a problem within many state and national forests. The same drones used for hunting lost hikers could also be flown for monitoring potential fuel sources, “hots-spots,” campers with illegal campfires, or assessing fire damage. Earthquakes present a serious problem to utilities and communication lines. In fact, as I write this, a 6.6Mg earthquake has just struck Buli, Taiwan. We don’t have to go too far back in time to recall the Sendei, Japan, earthquake. The Sendei earthquake presented a number of concerns. Transportation links to the region were broken. Communication and power were lost. Radioactive contamination resulted from damage to a nearby nuclear power facility. How could drones have facilitated aid to the public? Granted, I am using Sendei as an example, but keep this in mind – the location does not matter. What fundamentally matters is the recognition of how differing technologies can be married together to address a problem. The country or nationality is not the issue. Drones can be equipped with cellular technology and act as mobile cellular links. While the number of connections may be limited, rescuers would be able to penetrate the affected region and make phone calls. Drones can be equipped as WIFI “hotspots.” A flock of drones flying in a formation above an affected region could provide emergency Internet connectivity for both rescuers and those needing assistance. Both the WIFI and cellular technology could also be leverage to locate trapped or injured people. Human being emits thermal energy. Drones equipped with thermal sensors could also locate hurt or trapped individuals, or locate fires or heat sources not visible at ground level. Similarly equipped drones might also be equipped to “sniff” the air for noxious or flammable gases. In the case of the Sendei earthquake and the damage to the nuclear power facility, a drone could have been flown into the affected area in lieu of putting people at risk. Drones equipped with radiation detectors could map out the extent of radiation. With embedded GPS, all drone data has the potential of being mashed into mapping applications. A clever programmer/cartographer could generate on-the-fly maps of radiation contamination. But, we need not limit ourselves to radiation. Drones would be ideal for determining the plume from airborne pollutants released into the atmosphere. Hurricanes represent another threat to public safety. While information is increasing in density each hurricane season, meteorologists and climatologists still lack data (and funding) for research. Huge gaps in our knowledge exist even with several weather satellites in geosynchronous orbit around Earth. Weather satellites provide us with important small-scale (large area) data, such as temperature, general details of atmospheric composition, cloud cover, cloud type, and sea surface temperatures. Meteorologists need real-time, continual, data collection covering a variety of atmospheric variables. Changes in air pressure not only at the surface but aloft are critical to understanding the movement of upper level winds. Temperature and humidity aloft are also critical factors in determining cloud cover, cloud type, deposition, ice formation, and other elements important in storm formation. Currently, a number of technologies have been implemented to augment the collection of weather data. Some commercial aircraft contain weather instruments which transmit data back to ground collection stations. Many Weather Watchers maintain private Stephenson Shelters which collect and send weather data to the National Weather Service (NWS). The station data then appear on websites like the Weather Underground. At about 92 stations around the United States weather balloons are sent aloft. These weather balloons carry a sensor package to about 100,000ft (20miles), collecting data during the ascent. 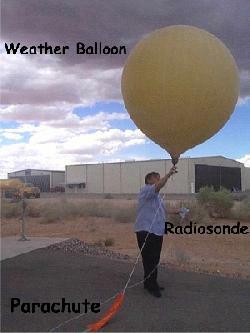 Weather balloons are launched twice a day, at 6am and then again at 6pm. And, the payload is generally lost, but some people who find the payload do send the payload back to the NWS. During hurricane season NOAA flies human-occupied aircraft into the heart of these powerful storm systems. While this sounds death-defying, read this account of a “boring” flight through a hurricane. 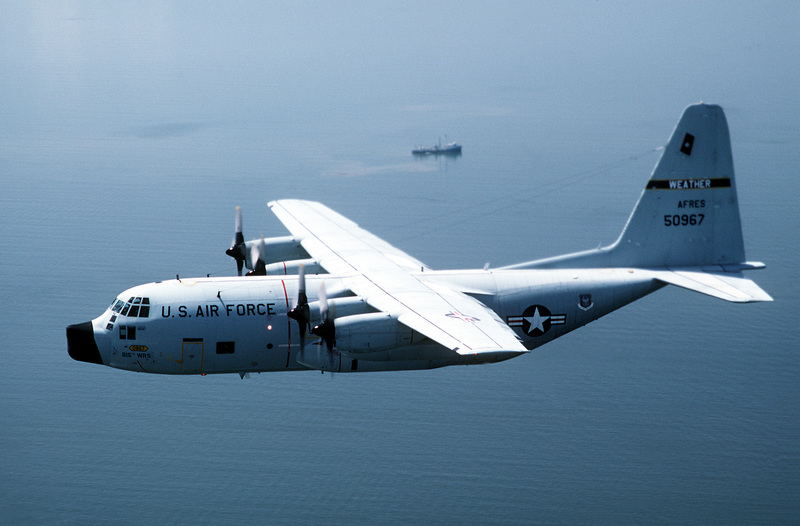 The U.S. Air Force flies Lockheed WC-130 “Hurricane Hunters” on 10-hour long missions to collect data on a particular hurricane. Not to put any pilot out of work; they could be re-trained to fly a “hurricane hunting” drone. 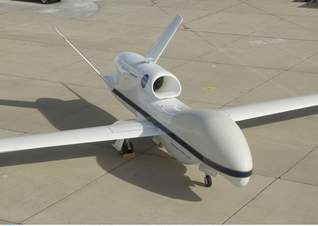 Drones similar to the Global Hawk could be modified to collect atmospheric data without placing human lives at risk. And, they could be flown more frequently with potentially a greater range. I’m imagining a greater range in order to study hurricane formation over western Africa, the “nursery” of our western hemisphere tropical storms and hurricanes. I hope I’ve provided some food for thought. I follow the philosophy “tools are tools, its how people use them which provide context.” A hammer can build a home for Habitat for Humanity, and, as fans of “Law and Order” or “Bones” can testify, a hammer can be used to bash in someone’s skull. No doubt, drones have uses that could trample a person’s right to Life, Liberty, and the Pursuit of Happiness, and privacy. Our government does not seem at all interested in protecting the private domain, which is both dangerous and disheartening. A drone with WIFI potential could easily snoop on internet traffic, or provide a platform for remote hacking of networks with absolute government complicity. And we have seen with the use of National Security Letters to circumvent warrants for collecting intelligence on U.S. citizens. No doubt, then, the potential for further comprise of a person’s rights. My next article may address some of those concerns. The current conversation going on across the United States varies from allowing only law enforcement access to drones, to allowing only private drone use, to the complete denial of drones to all. To me, all of this is simply unsophisticated, ignorant, and fear-based, which should come as no surprise since our government has continually leveraged perceived “fear” to assume more and more nuanced control over our daily lives since 9/11. However, there are legitimate uses of drones within Public Safety and Law Enforcement. While many people would not agree, I will offer some perspectives and examples whereby drones would be preferable to putting a person at risk. Finally, I’d like to thank some readers, for no other reason 56 of you selected to follow my blog, and I like to mention a few of you in each post. So, to Joe Seeber, Rachel Bok, Kurt Rees, and last but not least, Jo, thanks for your attention.